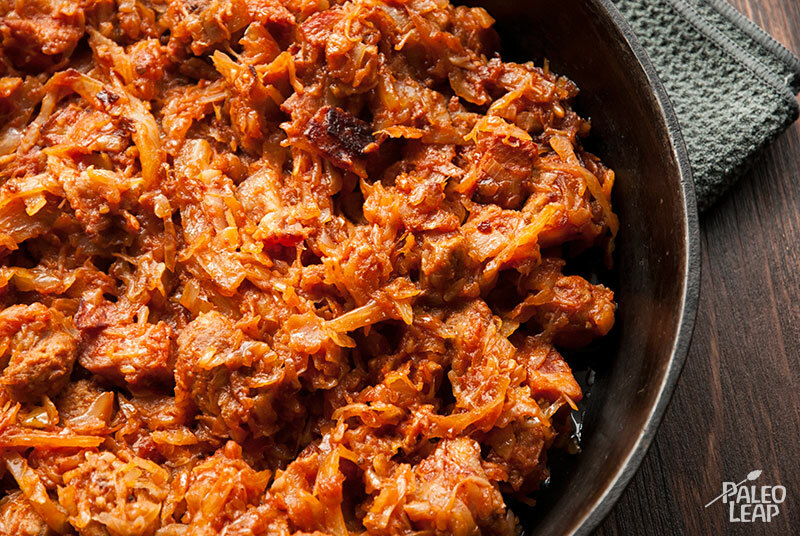 Bigos is already true to Paleo way of life, without even modifying the recipe. It’s considered by many to be the Polish national dish. Traditionally, there was a pot with some bigos cooking almost in permanence. There is no strict recipe and variations are endless. Hunters use to come back from a hunt and would put the meat they brought back in the stew, making it a different stew every time. One particularity of this dish is the use of sauerkraut and the sour flavor it gives to the stew. Sauerkraut is a favorite with Paleo mostly for the healthy functional bacteria in it, but in this case it will only be for taste because it’ll be heated and the bacteria will die. I recommend that you get in the habit of making your own sauerkraut at home for a fraction of the price of the bought version. If you decide to buy it for now, look for a real sauerkraut without vinegar in the ingredients. The sour taste should come as a by-product of the fermentation. Bubbies makes a great sauerkraut that is available in most health food stores. The original recipe calls for kielbasa sausage, but substitute with another kind of sausage if you can’t find a good quality kielbasa without additives, sugar or other intruders. All the meats used can be substituted for what you have available, it’s the spirit of this stew. Cut your washed cabbage in thin slices and boil until tender in a pot. Boil the sauerkraut in another pot in about 2 cups of water. Strain and keep the sour water aside. Sauté your diced pork in a pan with some cooking oil (lard, coconut oil or butter are good), then set aside. Sauté the bacon and sausage with the onion and garlic. In a large pot, combine the cooked cabbage, sauerkraut, sour water, tomato paste, spices and your cooked meats, onion and garlic. Let simmer for about 1 hour.